One of the things you get out of the article is the problem with standards. Now standards are needed but there is many times that so called standards get in the way of providing livable, pedestrian and bicycle friendly communities. A example of an organization sticking to its 'standards' and not paying attention to the big picture is down in Miami with FloridaDot and Brickell Avenue. 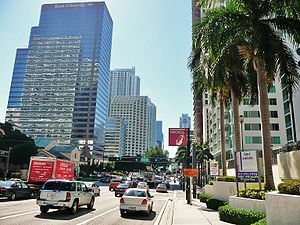 Brickell in the area in question is home to several high rises both office and residential but FDOT standards dictate that the street is designed to speed cars through the area thus putting pedestrians in danger by high speed automobiles in the area. A bus stop with a shelter has been taken out by speeding drivers on more than one occasion. It was pointed out a couple of times while I a was at Railvolution that the "black book" for traffic engineers goes against making streets more pedestrian and bicycle friendly. We saw one example of that in the Portland suburb of Hillsboro. The Transit Oriented Development of Orenco is bisected by Cornell Road. While the road is essential at the present time to make the retail component of the complex successful, there was much controversy surrounding the road. The traffic engineers wanted to make the road three lanes which of course equates to a very pedestrian hostile environment. After all, there is a direct correlation to the number lanes and the speeds along that stretch of road. After going back and forth the traffic engineers finally accepted two lanes in each direction with a center turn lane. However, the speed limit is still 35mph (which few drivers observe), making it hostile for residents to get from the apartment, condo and MAX station across Cornell to the main retail component of the complex. In fact Cornell has become a barrier just like a freeway between to the two sides of the development. The standards of traffic engineers are not the only ones that become a barrier to more effective transit development. While not written in law, the 'standards' fire departments become a hindrance to effective livable communities. There standards say that they should be able to turn around one of their fire trucks in the street. At one time most fired departments had a variety of vehicles but due to escalating cost and limited tax income, fire departments have the most part standardized on one size of fire truck (although fire departments often times still have some specialized equipment). Standardization has lead to the standard truck being the largest size necessary so they have a large turn radius. This results in fire departments fighting more pedestrian friendly streets in order to have plenty of room to turn their large fire trucks. There are more examples such as school districts and other government agencies that have policies that keep us from building more livable cities. We need to start changing these standards if we are going to have a chance at more livable communities. I was going to do a posting about traffic engineers today and how we need to "reprogram" them to look at things differently. However, Streetsblog has an article today that includes a referenced article that includes the insights of a traffic engineer. Not too long ago I posted about how the government since the days of FDR has been artificially inducing demand for real estate. Over the years owning a how has gone from being a privilege to the point it is now an entitlement. Now from the Inside Real Estate News out of Denver comes an article that promotes keeping another one of the long standing government enhancements to the real estate market: the mortgage deduction on taxes. Anyone who carries a mortgage on their home may deduct the interest from their taxes and so could have a tax deduction up to $2500.00. One of the reasons that the justifications for keeping the mortgage deduction is that it will increase foreclosures. Now if a $2500 tax deduction is the only thing keeping people out of foreclosure, I would have to say that those people could not afford the home in the first place and should not count on a government enhancement to keep them in their homes. In fact, as I mention in my previous post, more than 50% of the people buying homes could not buy them without some type of government enhancement and that number probably went substantially up in the last few years before the bubble burst. I could go on forever about the social-economic impacts that the enhancements have created in our society. After all, when FDR started these programs only 2% of homeowners had a mortgage and today it hovers somewhere around the 65 to 75% range. What you should not expect is any changes. The Reality lobby is one of the more powerful lobbying groups in many state legislatures and probably in DC too. They have too much to loose if the government stopped inducing demand for real estate. As with all journeys, this one begins with an itinerary. There are points of interest. There are schedules to be met. And, there is, of course, the occasional missed connection. As the new editors of this on-line publication, we shall attempt to keep this interesting and do so in a timely manner. We do not bring an agenda with us, but do believe in the free flow of news and ideas to that which unites us all together: the realistic belief in and rational expansion of passenger railroading in the United States. Therefore, without further ado, we would like to take a moment to introduce ourselves. David Carleton has been in the engineering field for over thirty years; more than twenty of those years with an ENR top 500 civil engineering firm in Central Florida. Along the way, he has worked in railroad civil engineering and railroad electrification, as well as landmark preservation and intelligent mixed-use land development. He also has an extensive background in publishing railroad books for historians and enthusiasts, alike, by virtue of the fact that his family founded and operated the publishing house of D. Carleton Rail Books. David has made himself available here in the role of researcher and historian, so that all the lessons learned along the way can be put to their best use. Daniel Carleton is a twenty-year veteran of the electrical power industry, with eighteen of those years spent in the nuclear field. He is now semi-retired, having attained the position of Supervisor of Mechanical Maintenance. Like his brother, he grew up around and in the world of railroading, and continues to draw parallels between these two branches of industry: railroads and power generation. Combining the context of railroading’s nearly two-century-old history with the strict attention to detail necessary in today’s environment, Daniel intends to be the vigilant eye on the ever-shifting landscape of passenger railroading. We would also like to thank Jean Sopko, of Black Bear Wordsmiths (blackbearws@yahoo.com), for graciously accepting the task of proofreading our musings and ramblings. Jean has a B.A. in English. She has been a newspaper proofreader, newspaper archivist, and medical transcriptionist. She has also held several highly-technical positions in the electronics industry. Many have been convinced, looking at the “modern” high speed trains of faraway lands, that history has nothing to teach us regarding the future of passenger railroading; however, as the old saying goes, “He who fails to learn his history is destined to repeat the seventh grade.” Sadly there are more seventh graders who are more prescient about the future of transportation than most adults. Another wise man once said, “Good ideas never go bad, they just sometimes are put on a shelf.” Shall we return to the days of steam, steel, and limiteds? No, that is not our vision; however, unless rational decisions based on proven formulas are made, the future of transportation, all transportation, is in jeopardy. Our journey has just begun. When and where it will end is still unknown. So for now let us sit back, relax, and gaze out the large window as the scenery whisks by. Waiter, there’s a High Speed Rail in my soup. After the roar of laughter settled down, day one of this year‘s Passenger Trains on Freight Railroads conference, presented by Railway Age magazine, was underway. Afterward, Moorman acknowledged his appreciation for passenger trains, having ridden them to school every day in Great Britain. Hardly a stuffy or stodgy individual, Moorman proved to be quite congenial and self-effacing. He sees his company’s relationship with Amtrak as “strong,” a position this gathering of railroad professionals would not deny. He made one fact quite clear: passenger trains on his freight railroad means 79 mph, maybe 90 mph in certain circumstances, but definitely not “High Speed Rail.” He also made it very clear that the increased track maintenance will not be borne by his railroad or stockholders. Moorman was quite concise that every corridor and potential corridor for passenger trains is different; they are “not all the same.” He pointed to three areas where current and future services are welcome: (1) Virginia — the increase of service by extension of a Richmond train to Lynchburg is seen as a success. Norfolk to Petersburg makes a lot of sense, but a connection will have to be built between the former N&W and SCL at Petersburg, after which one would “bounce your way to Washington” (a good-natured jab at his primary competition, CSX). The Commonwealth of Virginia is shouldering the cost of these services and upgrades. (2) Chicago — the grade separation at Englewood, which will raise a Metra commuter line over a busy NS freight line (also shared by numerous Amtrak trains), is one of many great projects in that area, improving freight and passenger service. (3) North Carolina — work continues in this state to continuously improve passenger service, and NS is committed to this work. Then Moorman addressed two areas that have caused great concern to the industry, those being the now reconsidered Federal guidelines for high-speed rail, and Positive Train Control. He described the Federal guidelines as “surprising to us” and “frightening to us.” The reward of passenger trains is slight, to the freight railroads. Then a call to any seeking to run a new passenger service: “Keep the word `risk’ in mind.” Whereas many may see the benefits of running passenger trains, it is the freight railroads who weigh the risk. As for PTC, it is a well-intentioned but bad piece of legislation, with an estimated price tag of $10 billion for the industry. This is going to be a big distraction to the railroads for the next five years. NS has estimated two-thirds to three-quarters of its track will require PTC. Following that was a panel discussion on the National Rail Plan, chaired by Al Engel on his first day as Amtrak’s new Vice President for High Speed Rail. The Plan is a project by the FRA. As it is limited to 120 pages, the Plan is a strategic vision for the future, and an answer to Congress when it asks, “Show us your High Speed Rail plan?” FRA replies, “We don’t have an HSR plan, we have a National Rail Plan.” Even so, there were many useful tidbits of information brought out in this two-hour segment. The freight hauling system in the United States currently moves 40 tons of freight per person, per year. The goal of the Plan is to realize an increase of intermodal (trailers or containers moving greater than 500 miles) on the railroads from about 23% today, to 50%. The largest roadblock to building new intermodal terminals is not NIMBYs, but the environmental permitting process; this is a critical issue for the Plan. The expected cost of applying PTC to a single locomotive is $60,000-70,000. Don Itzkoff, who will be moving to GE Transportation, then gave us an update on how things stand in Washington, DC. Simply put, HSR is now a higher political target. Everyone is feeling his way around this new scheme of transportation with the mindset of “play the game, then write the rules.” Of the more than $10 billion (soon to be over $11 billion) set aside for HSR, only $1 billion has been spent; however, rail is now very visible on Capitol Hill. Rail is now very much part of the surface transportation discussion, and rail is now speaking with one voice. Our luncheon speaker was none other than Joseph Boardman, President and CEO of Amtrak. He started off by joking that his education in Agriculture Management at Cornell qualified him for Amtrak’s top spot. Despite his wit and spry manner, he looked tired and concerned, as though the weight of the whole world was on his shoulders. Even so, he did attend the entire morning, and most of the afternoon sessions. He was quick to point out that despite the conference title of Passenger Trains on Freight Railroads, talk of High Speed Rail kept “sneaking” in. Unlike most of the participants who stuck to the ‘where and when’, Boardman seemed compelled to answer ‘how and why’ he is, where he is, and what he intends to do about it. His appreciation for public transit came with the gas lines of 1973 and a national lack of desire to fix the problem. Even now it is already too late to provide balanced transportation for the nation. Amtrak needs a fundamental change in its culture — it has visibly lost support due to its arrogance – and to this end, Boardman seeks to instill the three parts of humility into those in his charge: inclusion of all, being collegial, and pursuing continuity. He said later on that he wants the people in key positions to be able to make those decisions on their own with the proper input. Is this perhaps a move away from the micromanagement so prevalent in state agencies? Time will tell. Boardman acknowledged that his work is cut out for him. He noted that in the 1930s the number of passenger cars in the United States was around 65,000. By the late 1940s the number was down to about 30,000. Today, Amtrak stables less than 1400 passenger cars. As regards the latest order for rolling stock from CAF USA, everything except the stainless steel will be domestic, since they could not find a domestic source. After lunch, representatives from Veolia Transportation delivered an interesting discussion on Cognitive Distraction and Attentional Error, which included actual cab video of a commuter Railroad Engineer verbally acknowledging a restrictive signal, yet still throttling up his train as though it was clear. Fortunately, he and the oncoming train did stop prior to an impact. Much research has been done to study the mind and mental health of those operating our trains nationwide, and there is still much to learn. It should be noted that the Chatsworth wreck was not discussed outright due to the ongoing investigation in which the panel is involved. Next, a representative discussed what has been done and what is proposed in the Pacific Northwest. Like NS, Burlington Northern Santa Fe has been a cooperative partner in passenger rail, but has also made it clear that the maximum speed it will allow on its railroad will be 90 mph. Then Al Fazio of Bombardier Transportation North America, who has overseen the build and start-up of NJ Transit’s River Line interurban in southern New Jersey, spoke on Extended Temporal Separation. For years, the River Line has been running non-compliant (crash standard) vehicles on the same tracks used by heavy freight trains protected by positive separation and lockout of one service or the other. He pointed out that the FRA defines systems as either `rail transit systems’ or ‘short haul passenger railways’. The decision is based on the `purpose of the trip’. If it is a rail transit system, then they may use non- or near-compliant equipment with temporal separation. If it is a short haul passenger railway, then the equipment must be compliant. This will be important going forward, as Fazio pointed out there are no more abandoned rail lines left to convert to light rail. The next step will be shared use. The day closed with a sobering panel discussion, “Safety and Security: the Basics of Counterterrorism.” The panelists were quite dismayed over the cancellation of the second set of tunnels under the Hudson River; not because of the money lost in contracts, but due to lack of redundancy that presently exists in a heightened security environment. After a review of worldwide terrorist actions prior to 9-11, it was obvious that threats and sabotage against railroads is nothing new. Even so, the ‘Homeland Security Model’ developed and adopted after 9-11 does not fit all. There are five steps for counterterrorism on the railroad: (1) integrate thoroughly, ( 2) evaluate constantly, (3) know the threat, (4) foster vigilance — employees and rail fans, and (5) shift the balance. Since I was in Portland last month for Railvolution, I thought this Perils for Pedestrian video was appropriate since it covers the Portland area. Over the last two years since the election of President Obama, the big rage has been high speed rail. The administration has been very supportive of rail and has been pushing special funding for projects including ones in Florida and California. Even Utah Transit Authority joined a coalition that supports high speed rail in several western states. However, after the recent elections several states that were on the fast track for rail improvements now have governors that are putting the breaks on those systems including Wisconsin and Ohio. In addition the ARC tunnel from New Jersey into Manhattan has been canceled by the new governor of New Jersey. The question we have to ask is if these high speed rail projects are the best way to spend our money. I am going to say that some of these projects just do not make that much sense. A perfect example is the project between Tampa and Orlando. As was mentioned in a previous issue of This Week In Amtrak, this route is only 81 miles. While the current Amtrak service is not that fast, you also have to take into consideration that the some of the current Amtrak route has severe speed restrictions. It would cost substantially less to upgrade the existing rail line and provide additional trains in the market. Not only would the construction cost be substantially less but the cost to operate the system would be substantially less. What many people do not take into consideration is the cost of maintaining the high speed network. While cost increases the higher the speed, the cost goes up exponentially once you reach the 110mph mark. Wisconsin is another example of spending money for the sake of so called high speed rail. The proposal was to spend $800 millions dollars to build a line that would run at a maximum speed of 110mph. While some upgrade of tracks are needed especially near Madison where most of the tracks are relatively slow speed freight racks. However, the question needs to be asked, would you see that much more ridership with the train operating at 79mph than you will at 110mph? For the relatively short distance of the route would the increase speed have enough increase in ridership to justify the increased cost of the speed increase? Let me make it clear, I believe that rail service is and will be successful. California and Washington are two examples showing that rail passenger service can be a success. What I question is spending huge sums of money in areas that probably do not call for that kind of investment. Look at the investment that California is looking to make in high speed rail. Could the money be more effectively used by upgrading the existing rail networks, getting rid of slow spots, fixing bottlenecks, removing dangerous grade crossings than investing in all new infrastructure? I support an effective rail passenger system in the United States which we do not have right now. However, we need to walk before we can run and when it comes to rail passenger service we are not even crawling in the United States yet. Whenever a new light rail system opens, we often see bus routes being modified to service the light rail stations. While some complain about the loss of a one seat ride, others complain that preferential treatment is given to light rail. Meanwhile Portland will soon be in a different situation as its streetcar system continues to expand. The starter Portland Streetcar which has become famous for many reasons does not duplicate any existing bus service except for the northwest section where the existing 77 travels along a portion of the streetcar line. However, as the streetcar system expands as it is doing right now, it will soon start to duplicate existing transit lines. The new eastside loop will follow a portion of Tri-Met's existing route 6 which itself was modified from parts of old route 5 with the opening of the Yellow Line several years ago. Whatever Tri-Met decides to do with route 6 when the streetcar line opens in 2012, it would not have a dramatic effect on transit service in that area. My observations from riding the 6 line while at Railvolution is that most of the ridership tends to be from the Convention Center north (although my observations where limited so if someone from Portland wants to correct me on that...). What will have the ability to dramatically change transit service in the region is the next set of route proposals for the street. Specifically one of the top candidates to get another streetcar line is Sandy Blvd and Burnside which currently hosts one of Tri-Mets longest if not the longest line Route 12. Not only is the 12 route a very long bus route it is also a very busy route specially in its spine territory from Parkrose/Sumner Transit Station to Tigard. While many buses shortline in King City and Parkrose/Sumner, a bus traveling the full route from Gresham to Sherwood takes more than two hours to complete the journey. However once the Sandy/Burnside trolley line is built there will be new opportunities to change the 12 for the better doing the opposite of what is normally done when a new light rail line opens. If this was a light rail line opening the natural inclination would be terminate buses at the end of the line in the Hollywood section of Portland and in downtown for buses coming from the Sherwood area. The main reason for this is if you continue running the bus route that parallels the light rail line the light rail line doesn't perform up to its potential and the bus becomes a major drain on resources with little ridership. Instead of terminating the 12 at the end points, you can instead have the 12 become a limited stop route along the portion that will duplicate the streetcar line. As I have already said the 12 is a very, very long route. While it currently takes only 20 minutes to get from 42nd street to downtown currently by making the 12 a limited you can shave off about 5 to 7 minutes by making the 12 a limited. One good place to drop the number of stops is on Burnside where there is currently multiple bus stops within a few lock area. Also to improve the route even more Tri-Met should look at making the 12 a limited all the way through downtown and down Barbur to Beaverton-Hillsdale Road since that portion of the route is also has the 44, 54 and the 56 in the corridor. With these improvements you could shave off 10 minutes off the route. While 10 minutes is not anything earth shattering in speed increase, you would be saving 20 minutes over a round trip which could save you bus or two on the route. Those hours could either be used to increase service on the 12 or provide additional service on other routes that could use additional service. As the Portland Streetcar expands to new markets in the future, it will create new opportunities to make the existing bus service more efficient. This will create new marketing opportunities as streetcars provide the close to downtown urban service and buses providing faster regional service in areas that do not have light rail service. Any time a NIMBY wins a battle, there is often unintended consequences of that win. Sometimes the NIMBY's can end up with something worse than they were fighting against. Sometimes the consequence is a loss of something that could really helped the community in the long run. In Salt Lake City, the west side of the city suffers from the victim mentality of NIMBY. They see things as a threat to their community because everyone likes to pick on the west side. 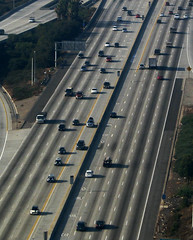 While the west side did get screwed with the building of I-15 and I-80 that effectively cut them off from the rest of the city and the rebuilding that did not do the right thing and lower the freeway, the will often become their worst enemies by fighting projects that will ultimately help their neighborhood. A perfect example of this is the Airport TRAX line. One of the plans for the line was to run it down 600 West and service Central Station in west Salt Lake. However, the west side fought against the project because it would have created a viaduct over the existing Union Pacific and Front Runner railroad tracks. However, the section of the west side that would have been effected by this viaduct is minor. In fact it is actually cut off from the rest of the west side by I-15. In fact we are only talking about a few homes along the street along with a fairly new apartment complex at the corner of 600 West and North Temple. 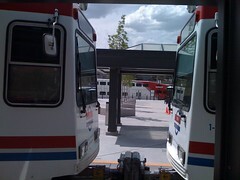 Now instead of the viaduct, TRAX trains on the Airport will not serve the Intermodal Station at all and instead will continue to travel on North Temple, turn on 400 West and connect up with the existing TRAX lines at South Temple. Now comes the unintended consequences. Because there will no longer be a direct connection from the airport to Central Station, the two proposed hotels for the station area will not be built. While they would have not provide a huge amount of jobs, but they would have created new opportunities for economic development in a part of town that desperately needs it. With the addition of the hotels it would have been more likely that Central Station and Gateway could be connected through redevelopment. However, all is not lost in the Central Station district. The city of Salt Lake does have plans on the books that would redevelop the area between Central Station and the old Rio Grande Station that would also connect those areas to downtown area. While the west side NIMBY's may have won a battle in their area, in the long run their actions may have actually set back their area a decade or more. Here is another Perils for Pedestrians Video. Here is a photo I took while in Portland last week. This is one of three stores that Safeway has opened that service the urban area. While some stores have a difficult with the concept of a pedestrian friendly store, it is nice to see that one chain has been making them work. I shopped at this one and the one in the Pearl District along with checking out some locally owned competition. Jarrett over at the Human Transit blog talks about Cul-de-sac's and the difficulty in trying to serve these with transit. In his presentation at Railvolution he also showed how hard it is to service points off the main route. Airports can often be a form of Cul-de-sac's that can be difficult to service with transit. If you look at most of the airports currently served by or to soon be served by rail transit such as Salt Lake City or Denver, you will see a design that is basically a Cul-de-Sac: you have travel to it from one direction but you have to turn around to get out of the complex. Last week I flew into Portland and took their excellent light rail service from the airport however, Portland is a perfect example of this principal. The Red Line ends at the airport and without a major reconstruction of the airport and/or the line itself, the line can never reach beyond the airport terminal itself. This is true of many of the cities that currently have rail service to their airports including Philadelphia, Portland, Chicago (O'Hare), the new line to Denver, the future extension of the Washington Metro system to Washington Dulles, Baltimore and St. Louis. The Airport TRAX line in Salt Lake City will also be a dead end line. There is a couple exceptions to this rule which includes the SeaTac in Seattle and Chicago-Midway (although both currently end at the airport stations there is planned extensions of both routes). However both of these stations are located at the far end of the parking lot and customers face a long walk to the actual airport terminals. I rode to SeaTac yesterday and despite the fact I walk a couple of hours a day, walking with luggage from the Link station to the airport terminal then to the respective gates can be a grueling experience. The one exception to the above is Ronald Reagan Airport in Washington where the Washington Metro system is able to service the airport terminals and then continue on. One of the worst example of providing service to an airport is the San Francisco BART line. First have the line to the airport plus a line that serves the vitally important connection to Caltrain at Millbrae. However, neither station has performed to potential due to the way the lines were designed. As Jarrett pointed out, trains can either serve the airport, then reverse direction and head to Millbrae, or they can split with one train serving Millbrae and another the airport, or you can have option 2 with a shuttle between the two stations. Every time the schedules change at BART they seem to try something new and nothing seems to work. Airport lines can provide a important multi-model connection to major airports. However, transit systems must also take into consideration if they are serving a cul-de-sac and whether those precious dollars could be better used for a line that can be expand to more areas in the future. Today was the final day at Railvolution and the my final day in Portland. There was two workshops today and I attended the one discussing employment centers near TOD and an introduction to complete streets. The first session had some good information from Los Angeles on the concentration of employment on the subway the sea which was followed by a presentation from a Bellevue, Washington planner discussing how that city is planning to develop two station areas beyond the downtown alignment controversy. The session on complete streets showed what states have passed legislation mandating complete streets (which also points out how little is being done about it). The session also talked about some of the difficulties being experienced getting road engineers on the program because it isn't part of their "little black book". Finally I went on my final mobile workshop of Railvolution which discussed some successes and difficulties of developing suburban TOD in the Portland area. We had the opportunity to check out several TOD projects and I will be discussing what was talked about on those tours and some of the things that was not talked about. That finishes up my time at Railvolution and Portland. On Friday I head up to Seattle on Cascade Talgo operated by Amtrak. For anyone who has not had the opportunity to ride the Talgos in service in the northwest I highly recommned it. Upon arrival in Seattle I had the opportunity to take my first ride on Link light rail but it was only through the downtown tunnel. From there I picked up a rental car since I will be heading to areas with poor transit service during the week and non-existant service on the weekends. The day at railvolution started off with the Community Streetcar Coalition meeting. The big news coming out this meeting was that Utah will receive a $26 million tiger II grant for construction of the Sugarhouse Trolley. So not only will we have four TRAX lines and another commuter rail line opening by 2015, we should have our first modern streetcar in the next couple of years. In addition $200 million in new start money will be freed up with the cancellation of the ARC tunnel project that would link New Jersey and New York. The tunnel has been very controversial with even rail advocates on opposing sides of the issues. I went to several outstanding sessions including the Impacts of Streetcars on Neighborhoods and Development, Biketopia which had some great information on how biking can effect development, Partnerships and Streetcars plus Blogging for rail. Finally the head of the American Public Transit Association gave a speech on the status of transit today. Today was the first full day of workshops at Railvolution. It opened up with a meeting of the National Assoiciation of Public Transit Advocates meeting which seemed to focus on what the Arizona Transit Association is doing with a grand they recieved from APTA. Next up was the opening Plenary which featured Gordon Price who is a professor at Simon Fraser University in Vancounver, BC on why we need Portland. He did a presentation on what Vancouver has learned from the Portland and what it could do better. Then Congressman Earl Blumenauer who is one of the biggest advocates of livable cities. On the workshop side I attended the Workforce Housing: The Missing TOD Link, Introduction to Station Area Planning and Livable Communties + Commuter Rail: Can We have both. One of the problems sometimes with these workshops is that you look at the discription in the program and what is being talked about is different than what the program seems to indicate. This happened the last time I was at Railvolution in Miami at the only workshop I could attend after doing my own presentation. One of the best events of the day was the Networking Event and I attended the one put on by Jarrett Walker who writes the excellent Human Transit Blog. After the session I had a much better idea of where Jarrett is coming from and he has also given me some great ideas for future posts. Finally there was a filmfest held at the Bagdad Theater in the Hawthorne district of Portland. The Hawthorne district is an ecletic streetcar era shopping district. The theater is an old time theater that is now not only a theater but sports a pub in what was the lobby of the classic theater. Many of the films came from Street Films out of New York which does many excellent presentations. The first full day of Railvolution was outstanding and I look forward to going to more excellent workshops today. Day 3 in Portland was a very busy one. I was hoping to attend one of the morning mobile workshops but they where all filled up but as it turned out I would have some personal business to take care of so it all worked out. I started off by getting up very early and catching the first route 20 bus to the Beaverton Transit Center. My purpose in this early morning jaunt was to ride WES which is Tri-Mets new commuter rail system from Beaverton to Wilsonville which is the first true suburban to suburban commuter rail system (unless you want to count some of the Conneticut DOT shuttles such as Danbury but thier primary purspose is to connect up with the New Haven to New York commuter trains). I could have caught the first train after my bus arrived but I wanted to get some OJ but despite the early morning time (6:00AM) there was a good crowd getting off the train and a few people getting back on. I caught the train that left at 6:28AM. There was a fully seated load getting off and a few people getting on. There is only 3 mid route stations but most of the passengers would board at the last two of those stations which suprised me. By the time we arrived in Wilsonville there was a full seated load. The Wilsonville station is kind of isolated but it does have connecting bus service to the state capital of Salem so many may have been state workers. WES operates with DMU's (Diesel Multiple Unit) cars made by the late Colorado Railcar. These are the only DMU's that meet the current Federal Guidlines to operate on regular rail lines and fortunately despite the demise of Colorado Railcar another company US Railcar is taking over production. The WES maintenance facility is located next to the Wilsonville station and I could only see one spare DMU car along with two RDC cars which are 50+ year old DMU's that the private railroads used extensively with the decline of passenger rail service in the 50's and 60's. Leaving Wilsonville for the trip back we had a half a car load seated which comprised mostly of women which is unusual for commuter rail. However, the numbers evened up by the next stop at which time we had standing room only conditions. There was one lady talking loudly to a couple of friends who took up two seats so no one else could sit down next to her and a guy behind me who I saw later at Railvolution who made it clear no one was going to sit next to him. Some people are just down right rude and very inconsiderate. The train remained SRO until we arrived Beaverton. I will discuss in more detail WES once I am done traveling. My first Mobile Workship of Railvolution was in the afternoon and was "Portland's Maturing Streetcar Neighborhood's" which discussed how the Pearl District and its surronding neighborhoods came to be and we had question and answer sessions with one of the architects, devolopers and business owners that made the streetcar and the neighborhood successful. One of the biggest surprises was the developer responsible for making the Pearl District what is is today was actually a suburban developer originally that is now solely focused on urban development. Once will do several articles in the coming weeks going into more detail of what I learn at Railvolution and how it can apply to other cities across the nation. Today was spent more time on foot than on transit taking time to check out near the downtown area. I had the opportunity to check out south, west and north of downtown including the Pearl District. However, I did make some trips on MAX and bus service. Yesterday I missed riding the new Siemens S70 cars (or are they S90's?). These are the newest cars in the Tri-Met system and will soon be in service in Utah. However, today I finally was able to ride them not once but twice. Riding both the older Siemens low floor cars that Tri-Met purchased for the opening of the westside line back in the mid-1990's and these new cars are better than comparable low floor buses and don't seem to suffer from the same downsides as on the bus side except for lower capacity. One interesting aspect of the Portland cars is that only one side of the car has a operator cab. Since Tri-Met runs nothing but two car trains due to how short their blocks are, it made since to save the money and increase capacity by doing away with the second cab controls. Tri-Met is able to save money by not requiring all the controls and electronics that are required in a cab and increases capacity in the car. UTA does not have this option since they can run up to 4 cars in rush hour but at other times can run anywhere from one to three cars. It is interesting to ride in an area that would be a operator cab if it was operated by any other light rail system. Tomorrow I hope to have the opportunity to ride Tri-Mets WES commuter rail line in addition to going to my first Railvolution event which is a mobile workshop on Portland's maturing streetcar neighborhoods. It ought to be very interesting. This blog is being made from the city of Portland, Oregon as I spend a couple of days in the city before attending Railvolution which starts on Monday. The entire time I am in Portland I will be using Tri-Met bus and rail service to get along. I wish I could say that the trip started on transit but I needed to be at the Salt Lake airport at 6:30am and that is an hour before the first UTA route 550 gets to the airport so I had to use the Express shuttle to reach the airport. Hopefully once TRAX is operating they will have earlier service for those taking those first flights of the morning. After arriving in Portland I made the short walk over the the MAX station which is located near the baggage claim area of the airport terminal. It has been 6 years since I was last on the Red Line from the airport and there has been many changes. Back then the train didn't allow passengers off at the Mt Hood station, but today there has been a large amount of development along the line, sadly much of it auto centric such as IKEA and Target but there is also some hotels locating along the line and promoting their access to MAX. At the Gateway Transit Center I transferred to the Green Line since it is the only MAX line I have not ridden. The train I caught from Gateway came from the Ruby Junction carhouse on the far end of Blue Line in Gresham so there was not many passengers. The Green Line epitomizes why freeway transit lines don't work well. Except for the SE Main station which serves Mall 205 which is also an auto centric shopping center, most of the stations are difficult to reach and have difficult access from street level. The one exception is the SE Flavel station which is at street level and has bus service directly in front of it. However, the most of the high density residential development in the area is actually located on the opposite side of the freeway from MAX with the freeway creating its usual wall between neighborhoods. The final station is at the Clackamas Town Center Mall. However, to reach the mall you have to pass a multi story parking garage which also houses the bus stops of the transit center and then the main mall parking. Once again the transit center is on the mall property but does not integrate with the mall. Hopefully over time mall management will see the opportunity of blending the mall with the transit station. I then headed into downtown Portland on the Green Line while I had been down the transit mall in a bus a few years ago, today I rode light rail down the famous transit mall. I was hoping to ride the new Siemens S series cars that Portland has and will soon be in service for UTA but every train I rode had the older Siemens low floor cars. I also had the opportunity to ride the Portland streetcar on the short stretch that I have not previously rode from Riverplace to the current end of the line at SW Lowell. I was hoping to ride the Willamette Shore Trolley along the proposed route of the Lake Oswego Rapid Streetcar but their website said they have mechanical problems that will have it out of service until sometime in December. 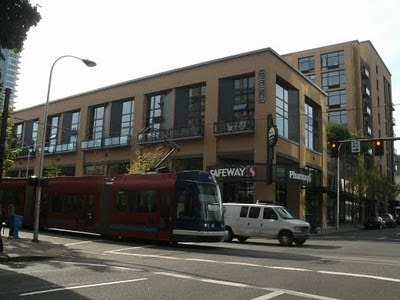 I also shopped at the Safeway Store at Jefferson and 10th which is on the streetcar line. This store is actually a pedestrian friendly store. Despite what Kroger says, a pedestrian friendly store can be built and be successful. Portland is an outstanding town to explore by transit and by foot and I will be doing more of that tomorrow. On Saturday I will be heading up to Portland to attend Railvolution. The entire time I am in Portland I will be using Tri-Met or walking. I will try to blog on a daily basis on my experiences riding the system, some thoughts on the Portland area and the different sessions I will be attending.